UFO SIGHTINGS DAILY: NASA Finds 70 Meter UFO Orbiting Asteroid Near Earth, Feb 2016, Photos, UFO Sighting News. NASA Finds 70 Meter UFO Orbiting Asteroid Near Earth, Feb 2016, Photos, UFO Sighting News. 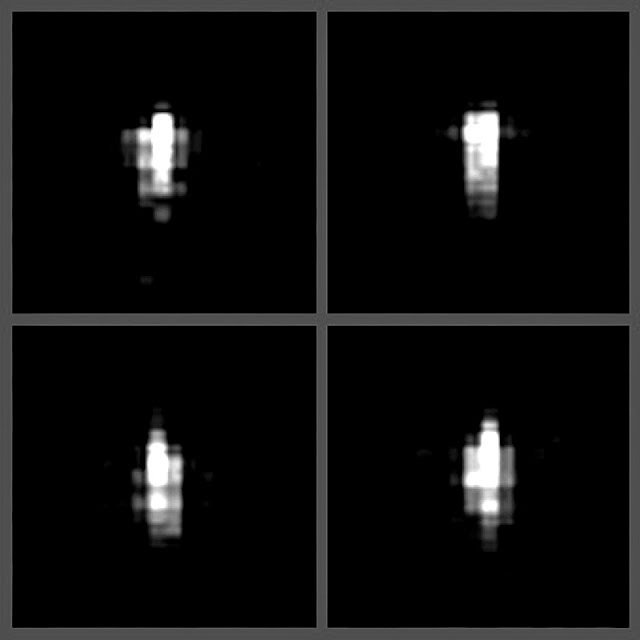 Below, you see the close up view of the UFO that is orbiting asteroid 2004 BL86 right now. The UFO is 70 meters long. They call the UFO a small moon, but its not. 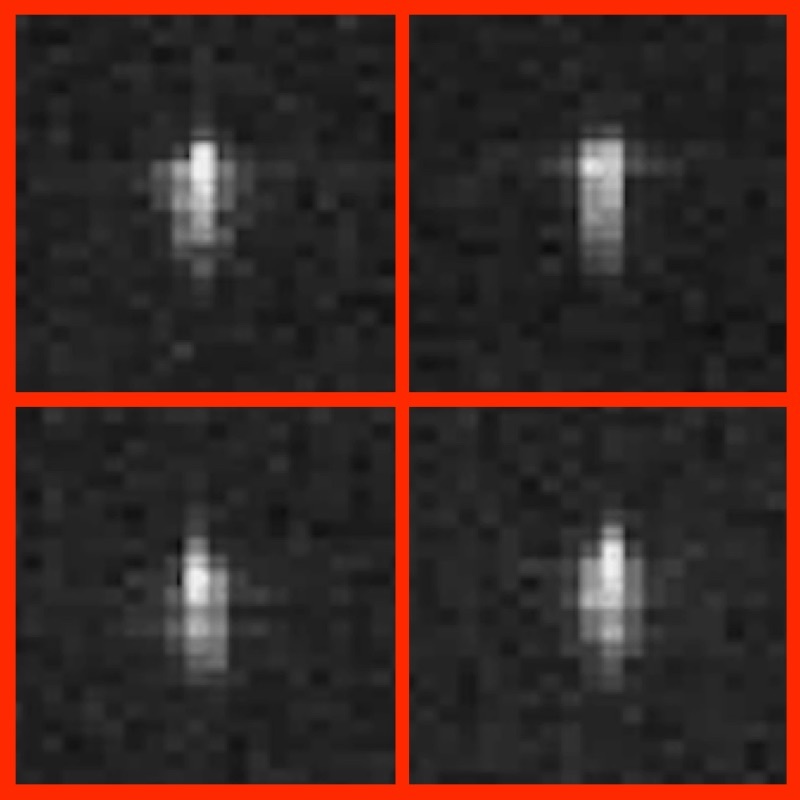 As you see from the focused photos below, The UFO has a long metallic cylinder hull and two more smaller cylinder sections on opposite sides. The UFO is spinning, which gives us a great view of it from different angles as you see below. It came 750, 000 miles from Earth. Above is the focused altered version, below is the original untouched version. 1/27/2015 UPDATE: The Goldstone scientists observing 2004 BL86 are part of a team of astronomers from around the world who have been characterizing the asteroid. Spectroscopic observations of 2004 BL86 made by Vishnu Reddy, a research scientist at the Planetary Science Institute in Tucson, using the NASA Infrared Telescope Facility on Mauna Kea, Hawaii, indicate the asteroid's spectral signature is similar to that of massive asteroid Vesta. Located in the heart of the solar system's main asteroid belt, asteroid Vesta was the recent destination of NASA's Dawn mission, which is now on its way to the icy world Ceres. Scientists working with NASA's 230-foot-wide (70-meter) Deep Space Network antenna at Goldstone, California, have released the first radar images of asteroid 2004 BL86. The images show the asteroid, which made its closest approach today (Jan. 26, 2015) at 8:19 a.m. PST (11:19 a.m. EST) at a distance of about 745,000 miles (1.2 million kilometers, or 3.1 times the distance from Earth to the moon), has its own small moon. The 20 individual images used in the movie were generated from data collected at Goldstone on Jan. 26, 2015. They show the primary body is approximately 1,100 feet (325 meters) across and has a small moon approximately 230 feet (70 meters) across. In the near-Earth population, about 16 percent of asteroids that are about 655 feet (200 meters) or larger are a binary (the primary asteroid with a smaller asteroid moon orbiting it) or even triple systems (two moons). The resolution on the radar images is 13 feet (4 meters) per pixel. The trajectory of asteroid 2004 BL86 is well understood. Monday's flyby was the closest approach the asteroid will make to Earth for at least the next two centuries. It is also the closest a known asteroid this size will come to Earth until asteroid 1999 AN10 flies past our planet in 2027. Asteroid 2004 BL86 was discovered on Jan. 30, 2004, by the Lincoln Near-Earth Asteroid Research (LINEAR) survey in White Sands, New Mexico.